A crochet hook, obviously, is a must. They come in lots of different sizes and shapes. Some have thicker handles and some thinner, some are even lighted. You’ll find hooks made from metal, plastic and different kinds of wood. The size of the hook is the most important factor that you need to consider. It is determined mostly by the weight of your yarn. When you have the right sized hook for your yarn, your gauge will be just right, too. All the other variations in hooks are your choice, what feels good in your hand and is the most comfortable to you. 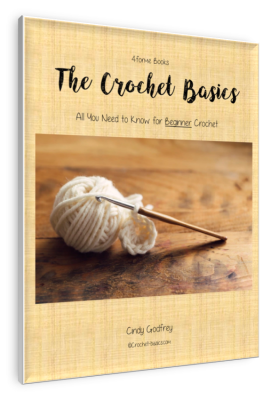 So let’s learn some basics of crochet hooks. 1 – Tip or Head - This is where you’ll “hook” yarn and move it through your stitches. 2 – Throat – This area widens from the hook to the main shank size. Be sure that you are NOT working your stitches in this area. 3 – Shank or Shaft – This part of the hook holds your stitches. This also controls the size of your stitches when they’re worked correctly. 4 – Thumb Grip – This flat area is where the hook is held between your thumb and other fingers. 5 – Handle – This is where your other fingers will rest and helps to balance the hook. There isn’t a standardization for hook sizes yet. So, sizes may vary from brand to brand. If you’re not sure if your hook is the right size, check the metric diameter on it, which is usually stamped into the thumb grip. This tells the diameter of the shank/shaft. If it isn’t there, use a reliable hook gauge and measure around the shank. Choosing a hook size that matches the correct gauge for your pattern is the most important factor! Always go by the gauge. Try different sizes until you find the one that can achieve the right gauge. 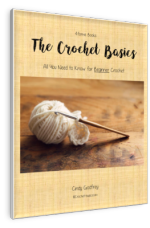 There are basically two types of crochet hooks, yarn hooks and steel (thread) hooks. Yarn hooks are made of aluminum, plastic or wood. 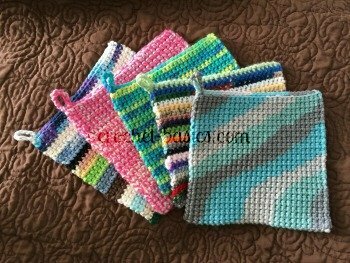 They are used for regular yarn from super fine to super bulky. Steel (thread) hooks are exactly like they sound. They’re made of steel and are most commonly used for lace weight thread. These hooks are generally much smaller than yarn hooks, although, there is some overlap in sizing. Yarn hooks increase in size as the hook number/letter increases. Hook B-1 will be smaller than hook G-6. However, steel hook sizing works in the opposite way. As the hook number increases, the size of the hook decreases. So, hook size 0 will be much larger than hook size 8. Here's a reference to go by. *Letters or Numbers may vary. Rely on the millimeter (mm) sizing. Leave Crochet Hook and continue on to Additional Crochet Supplies.